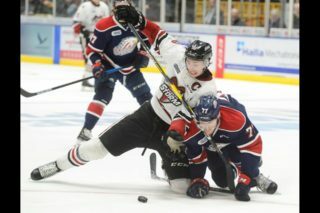 It was déjà-vu for the Kitchener Rangers, but this time they hung on for the victory. 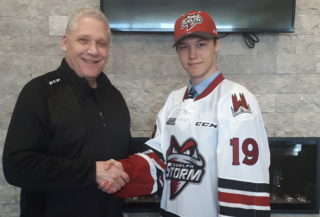 For the second consecutive game, the club had a 2-0 lead late in the third period against the Guelph Storm but there was no dramatic comeback this time around. 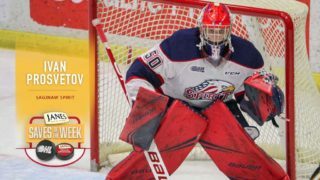 Guelph did chip away at the lead, but Kitchener held firm for a 2-1 win Thursday night to take a commanding 3-1 advantage in the OHL western conference best-of-seven quarterfinal. 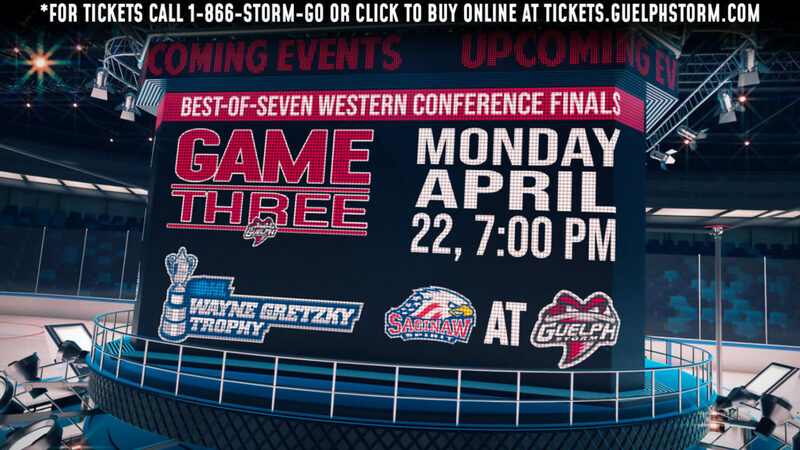 Kitchener can clinch a series win back at the Aud Friday. Thursday’s tilt had a familiar feeling. 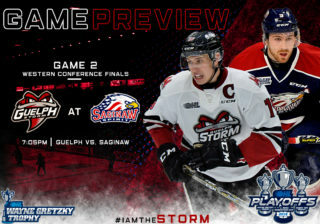 The Storm outshot, outchanced and held an advantage on the power play just like in Game 3, this past Tuesday. In that affair, the Rangers blew a 2-0 lead in the final five minutes and lost 3-2. But there was no rally repeat for the Storm. Instead of sitting back, the Rangers kept on the attack until the final whistle. The Rangers’ dressing room was pumped heading into the final frame. Players were determined to halt any kind of comeback by the home side. 1st Period-1, Kitchener, Faksa 2 (Gilbert, Puempel), 10:59. Penalties-McEneny Kit (tripping), 8:33; Fanelli Kit (delay of game), 12:34; Iafrate Kit (roughing), 15:17; McNaughton Gue (slashing), 15:17; Rieder Kit (hooking), 19:20. 2nd Period- No Scoring.Penalties-Leslie Gue (check from behind), 8:15; Thomson Kit (cross checking), 12:47; Bertuzzi Gue (charging), 16:56. 3rd Period-2, Kitchener, Leivo 1 (Faksa, McEneny), 9:50 (PP). 3, Guelph, Mitchell 1 (McGinn, Richard), 11:35 (PP). Penalties-served by Poliziani Gue (too many men), 7:59; Schoenmakers Kit (holding), 10:34; Pedan Gue (cross checking), 10:34; Leivo Kit (tripping), 11:08; Leivo Kit (roughing), 18:51; McGinn Gue (unsportsmanlike cnd. ), 18:51. Shots on Goal-Kitchener 8-8-16-32. Guelph 16-13-12-41. Power Play Opportunities-Kitchener 1 / 3; Guelph 1 / 5. Goalies-Kitchener, Gibson 3-1-0-0 (41 shots-40 saves). 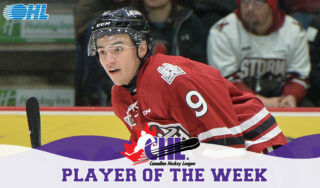 Guelph, Sparks 1-3-0-0 (32 shots-30 saves). Referees-Mike Marley (31), Scott Ferguson (35). Linesmen-Jason Finley (37), Ryan Wilson (54).